Vintage Hi-Fi Speakers, Vaccum Tube Amplified Speakers, Active Studio Monitors, Amplified sub woofers are normally found here. Add bottom low end to any speaker system to make the sound of todays small speakers satisfying and BIG! Description: These vintage loudspeakers were probably made in the late 60's to early 70's and are quite interesting. Built into a rugged plastic suitcasse, which is made form soft plyable material and speaker mounting re-inforced with a super heavy duty metal ring they invite professional usage. Their sound is somewhat mid rangy, but with a seemingly very smooth curve. These speakers have quite a nice sound, especially for Hi-FI applications as well. If one uses the tone control of a stereo amplifier to emphasize the highs and the bass, to extend the mid range in both directions, one experiences a rather smooth sound that has good bass response and a quite natural character. Sond is very present and lively as if the music wa spalyed directly in form of the listener. This is probably due to the fact that the soft plastic casing emits sound as well and into all directions. As lighweight as these are, due to the rather small suitcase enclosure, these are perfect for vocal and instrumental applications as well, especially for the road, as these take up little space. As the original speaker drivers of these speakers had been exposed to moisture and their cones because of it were bad, I replaced them. The replacements drivers I had were made by the same manufacturer very similar in model and in near mint condition, but are designed as musical instrumental speakers. This invitres to use them for guitar work or vocal applications. I think you will love them and treasure these fo ryears to coem! Condition: Good to excellent. Only minor sings of age. Work perfeltly. Work perfomred: Replaced the drivers with very similar of approximate same age musical speakers. Upgraded input terminal form screws to 1/4" input jacks. Physical celaning and etail work. Tested Work very well and have nice sound!. Lot: 1 Pair of EV Sonocaster professional speakers as dscribed above. Cable will work for other equipment that has the same type of power connector as well. Description: This KLH sub-woofer system is desinged to add low end bottom bass frequencies to any existing stereo with ease. For easy hook-up this unit desrives it's input signal form being connected between your stereo and it's speakers - in other words: disconnect the speaker wires form yoru existing speakers and connect them to the sub woofer then run anothe rpair of speaker wires form the sub woofer to yoru existign speakers and voila: now you wil lhave bottom end. This design also will allow to drive your system hotter, as the circutry in the sub woofer removes the low bottom end form your speakers - AND: you will have more power and volume overall, as the sub woofer is amplified. It could not get any simpler than this: UPGRADE the sound of your computer, office stereo, bed-room stereo or where ever you enjoy a more full and satisfying sound! Make your sound BIG! Features: Low and High level inputs: either connect into the audio path of your stereo (RCA line leve inputs and outputs - use as a feed through) or connect to the speaker path of your stereo. Volume and frequency adjustments knobs (40-180 Hz), Power control switch: on, auto (turns itself on/off in the presence of music) status indicator LED; Phase switch: allows to remedy phase cancellations that may occur in your specific location; Built-in amplifier: estimated 85W RMS or 100W peak. 8" long throw woofer with calibrated vented port. Dimensions: (aprox. ): 14" x 12" x 13"
Condition: The outer cabinets shows dust, minor dings and other signs of use, but overall appearance is good. Tested, working - All controlls and switches recently de-oxydized for reliable operation. 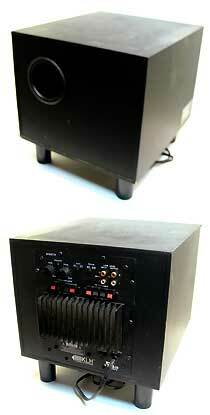 Lot: 1 KLH PSW-8-100 subwoofer with model: S100ETH built-in amplifier. Organ Speakers, Raw Speakers and Replacement Speakers have moved to HERE! A note by Marc Rising Star ©2006 ultraelectronicactive.com.. These kinds of speakers are ideal for vaccum tube amplifiers and receivers, as designed when this was the only equipment avaialable. Basically speakers for vaccum tube equipment are quite different from modern equipment. The difference is: In the days of old, output power from amplifiers was precious and in low wattage ranges. Speaker desings were aimed to use this precious energy wisely with high efficiency designs (resolution and detail in sound! ), and in the context of using avaialble materials at the time. These materials often were based on natural resources compared to synthetically engineered materials of today. Thus vintage speakers sound quite different than modern ones: warmer and more natural, but at times can be more mid rangy, occasioanlly boom in bass, or lack it. Truely vintage speakers are also not recommended to be used with modern equipment, unless the equipment used with them provides modest output power. Ideally speakers would be able to handle double the amount of rated RMS power of the amplifier that drives them. So: as vintage speakers are designed for low power ranges, vintage speakers are easily overdriven and with too much power and easily destroyed. Vintage STUDIO MONITORS! - Great Sound! - Great for Tube amplifiers! Voice of Music - Maodel 64 ! Description: With the "Sandwich" Loudspeaker (circa 1960) H.J. Leak and CO LTD. had considerable sucess in revolutionizing loudspeaker design in the industry by innovating cone materials to produce cone stiffness 200 times greater than conventional paper cones. The resulting cone movement follows the waveform of the incoming signal with great accurately for most detailled sound reproduction. The "Sandwich" loudspeaker received its name due to its diaphragm, which was made from a thick section of expanded polystyrene sandwiched between two outer layers of aluminium. The Sandwich loudspeaker had considerable success in the professional audio industry, where it was used extensively, and in aplications where listening is critical. H. J. 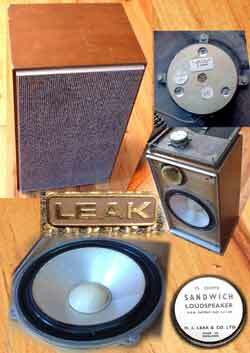 LEAK & CO. LTD. is Brithish Company out of London, which designed and manufactured specialised audio electronic instruments for the communications industriy. Leak is known for truely professional audio products of the highest quality. Features: This model Sandwich loudspeaker is a two-way acoustic suspension system with a 13-inch woofer and a 3 inch tweeter (approximatly), which is crossed over at 900 Hz. The speaker cabinet is damped and sealed at a volume of approximatley 2 cubic feet. The cabinet walls are very heavily damped as well, acording to the sandwhich principle with a thick bituminous lining. 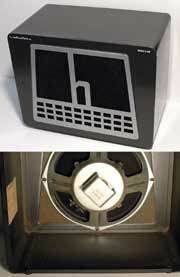 The magnet of the woofer is rigidly attached to the rear wall of the cabinet for increasied cabinet rigidity. Dimensions: (aprox. ): 26" x 16" x 11.5"
Raw Vintage Speakers such as Guitar and Organ Speakers have moved to HERE! Description: This pair of vintage 1950's American made Voice of Music high efficiency speakers is charakterized by its virtually flat desgn - only 5 1/4" deep. This is achieved by a "flat" woofer, which has it's magnet mounted at the inside of the cone. What you will find in this system is natural and realisic sound throughout the range. These speakers are based on a 3 way tuned bass reflex system with a ported tuned card board tube. The exact date of thsi system is unknown to me but I woud date it late 50's early 60's: Thus ideal to be used with vaccum tube amplifiers. These speakers are quite sensivie and produce high volume even if driven only with small single ended 6BQ5 based amplifier. Estimated power rating: 20W. 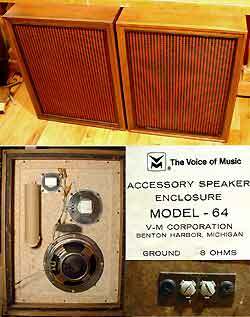 Great vintage sound - own a piece of American made Quality Historic Equipment. Voice of Music was among the top ranking brands if it come sto quality and quality in sound! Condition: Work nicely and sound great. The cabinets of these speakers are in good condition and clean, but due to their age have minor scratches and dings only visible upon close inspection - Actual items shown in above photo - as with all equipment on my web site! And: please feel free to inquire for larger and higher resolution images. Description: A great cabinet to build a guitar amp! Halicrafters (USA) manufactured HAM radio equipment and this is a systmespeaker form the 50's. This is great cabinet to build a guitar amp or to turn into an extra cabinet by mounting an appropriate 10" guitar speaker in this enclosure. It sounds very nice for guitar! Condition: Case very clean with signs of use (9 ot of 10) - Currently a vintage 10" speaker mounted which' s voice coil slightly rattles. Raw Vintage Speakers have moved to HERE!